Joyfulness decks up the day of a family close to you when you send them this Frill-to-Fascination Gladness Pack. This Pack exhibits 1/2 Kg Eggless Chocolate Cake, a Cute 6" Teddy Bear and a fine Flock of 3 vibrant Red Roses. 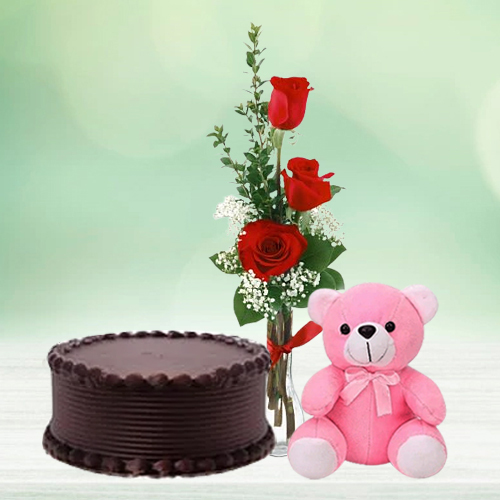 Flowers Delivery Cuttak, Send sweets Bhiwadi, Wedding Cake Ooty, Diwali Mithai Kurnool, Send Flowers and Gifts to Dhanbad, Online Shop Mumbai, Flower to Trivandrum, New Year Flowers Ramgarh , Fresh Fruits Gulbarga, Send Gift Rajkot, Dry Fruits to Sirohi, Birthday Delivery Modinagar, Sending to Kozhikhode, Flower shop Chittoor, Salem Online Cake Delivery.